The National Space Society (NSS) is pleased to announce Dr. Stephen Hawking as the 14th recipient of NSS’s Robert A. Heinlein Memorial Award. 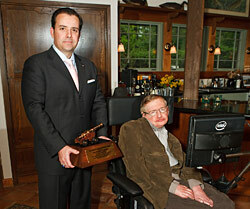 The award was presented to Dr. Hawking at a special ceremony at the Cooks Branch Conservancy in Montgomery, Texas on Wednesday, March 28 and is given in recognition of his outstanding and continuing public efforts in support of human space development and settlement. Also see Stephen Hawking 25-minute video: Why We Should Go into Space (with transcript). 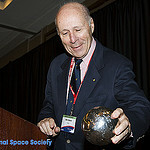 At the Saturday Luncheon a 2012 SPACE PIONEER AWARD for Mass Media was presented to Author Ben Bova. Ben, a former President of the National Space Institute and a former Editor of Analog Magazine and Omni Magazine, had served as President of the Science Fiction and Fantasy Writers of America and many of us have been reading his works, totaling at least 115 books, for much of our lives. Also at the Saturday lunch, the 2012 Jim Baen Memorial Writing Contest Award was presented to Martin Shoemaker, standing in for winner Richard Johnson, for his story “Taking the High Ground”. At the Sunday luncheon a 2012 SPACE PIONEER AWARD was presented to Board of Governors member Art Dula, in recognition of the innovative work he is doing as head of the Excalibur Almaz company (which is trying to convert Russian spacecraft to commercial use, specifically launching passenger-carrying spacecraft to its own small space stations in orbit around the moon), and his excellent stewardship of the Heinlein Trust and Heinlein award. 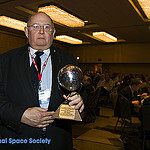 A 2012 SPACE PIONEER AWARD for Science and Engineering was presented to Dr. Robert Farquhar. The Space Pioneer award recognizes Dr. Farquhar’s truly pioneering work, (including articles, papers and management of actual missions), on orbital mechanics, efficient trajectories and innovative methods for use of LaGrangian Points. 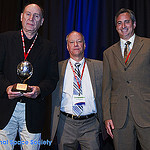 At the Saturday Dinner, a 2012 SPACE PIONEER AWARD for Science and Engineering was presented to the Mars Reconnaissance Orbiter team. In photo: Wayne Sidney, Chief Engineer, Dr. Richard Zurek, Project Scientist, and James K. Erickson, previous Project Manager.The MRO vehicle began work at Mars orbit in early 2006, and continues with its extended mission. It has provided invaluable information in the form of photographic and radar imagery and other data, as well as serving as one of the orbiting relay stations for the Mars Rovers and Phoenix lander. At the Sunday Awards Banquet a 2012 SPACE PIONEER AWARD for a Lifetime of Service to the Space Community was presented to Frederick Ordway. 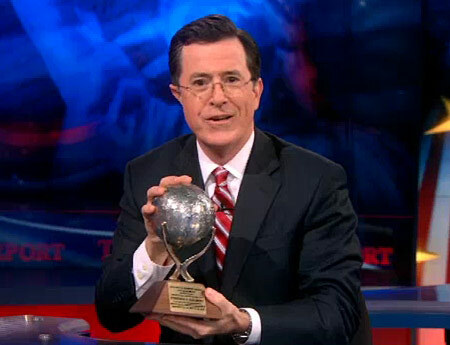 The award honors him for his many contributions to the advancement of space technology and to the space community, which include working extensively with Dr. von Braun, and being the lead science advisor on the movie 2001.